Lean manufacturing or lean production is a systematic method for waste reduction within manufacturing production without losing productivity. 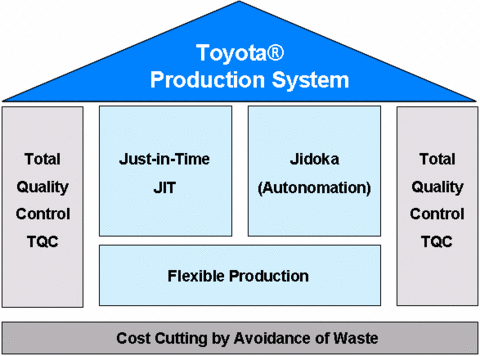 Lean was initially developed by Toyota to eliminate waste and inefficiency in its manufacturing operations. This development became so successful that it is being used in manufacturing around the world. Lean manufacturing produces enormous improvements in efficiency, cycle time, productivity, material costs, and scrap, all of which leads to lower costs and a better competitive position. Value is the only reason that manufacturers stay in business. A manufacturer must understand how the customer perceives value, and learn what the customer is willing to pay for and what they are not. Some customers are willing to pay more for higher quality while some customers are not. A manufacturer needs to evaluate the value stream, such as raw material, processes, equipment, and the labor necessary to get the product to the customer. This stream must be evaluated as to things that obviously add value; those that don’t add value, but are necessary; and those that have no value and can be eliminated. Flow is the progress of the work through production. When a production system is finely tuned, it has good flow with the work progressing steadily. When there are breakdowns in the flow, waste is created. A dependable flow leads to more consistent delivery. Pull is basically just-in-time-inventory to manufacture as close as possible to when the product is needed by the customer. By taking this approach to production waste associated with inventory, transportation, movement, and motion, waste can be eliminated. Nothing is ever perfect, but when steps that create value for specific products, allowing continuous flow, the process of reducing effort, time, space, cost, and mistakes, everything falls in line. Suddenly, perfection doesn’t seem like an irrational idea. With manufacturers upgrading to innovative and more efficient practices, it becomes evident that there’s a growing need for manufacturing machines and techniques to improve the process. Because of a robot’s repeatability, speed, accuracy and flexibility, the use of robots in lean manufacturing is increasing. Automation equipment—including robots—is rapidly becoming a core component to lean manufacturing and the reduction of manufacturing costs. Robots are being used to create efficiencies from the way raw materials are handled to finished product packing. They can be programmed to operate 24/7 for continuous production. They highly flexible and can be customized to perform even complex functions. Manufacturers need to utilize automation to stay competitive, and most importantly, automation can be cost-effective for almost every size of company. Industrial robots have become the backbone of all size and types of manufacturing. This increase in robotic automation has resulted in advanced production rates with improved quality. Automation with or without robots can increase the formation of waste and reduce profitability if not aptly designed into the lean system. Robots are not inherently lean because they could automate a faster creation of waste. When they are combined within the manufacturing process, a robot can support and enhance a lean manufacturing system by handling product quality and reducing waste. A robot can help increase production and reduce delays. They can also reduce training and changeover time. Automated production lines are planned to be an efficient partnership between employees and robots. The robots can be programmed for ideal performance, but employees cannot. An effectively designed robotic workstation must consider the volatile human, and realize that there could be inconsistent performance along the production line. Although using robots sounds good, their use must be justified by a return on investment analysis. Robots have proven to significantly improve the return on investment in a manufacturing environment; but the robots must be appropriately fused into the complete lean manufacturing environment to get the anticipated results. So, how do robots help with lean manufacturing? One example is a material handling robot, which can be set up to multi-task. It can perform other tasks between moving material. Robots have very little downtime, such as shift changes, breaks, etc. Compared to human employees, robots are less expensive to operate, especially when overtime is required. A return on investment can be quickly achieved when there is a high requirement for the manufactured product. The latest lean process, utilizing robots, is coordinated motion. In this arrangement, two or more robots are managed by a single controller. This allows for easy communication between robots to achieve coordinated maneuvers on a single part. Coordinating the motions of several robots can appreciably reduce the time wasted during the manufacturing process. Robots are helpful in lowering the risk of injury or death, as many manufacturing operations have a possibility of human harm, which can result in higher insurance and workmen’s compensation costs, and high employee turnover. Workplace danger results in fear, reducing morale. This is a great reason to use robots to improve workplace safety. Robots can significantly elevate the quality of work by removing people from boring, grimy and dangerous tasks, such as unloading parts from a fast-moving press, or working with molten metal, which are tasks not appropriate for human workers. It is critical that manufacturers strive for a system of lean production and lean management. While lean manufacturing is easy to understand, it is often challenging to implement, as it requires new viewpoints and management procedures up and down the complete value stream. Some of the challenges that manufacturers face to accomplish lean manufacturing are introducing a manufacturing cost reduction model; the optimization of material and product flow; site planning and expansion; the design of a risk management system; and importantly, developing lean leaders. Innovation can be utilized in all areas of a manufacturer’s business model. Lean thinking can be created around services, processes, distribution channels, and partner companies. If designed properly, robots can improve a manufacturer’s lean environment. Robots can accomplish jobs with speed and accuracy that can’t be attained by human employees. There are not many manufacturing solutions that can reduce waste as well as robots. There is no doubt that robots can add to a manufacturer’s bottom line.